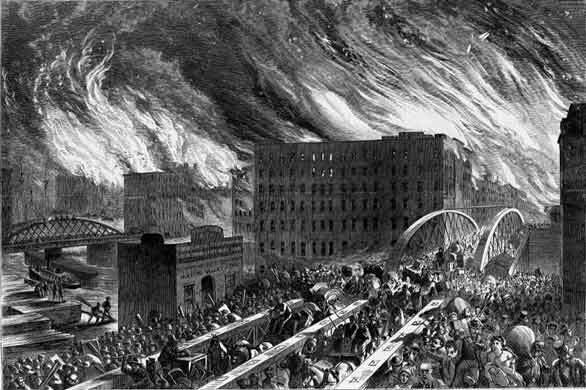 An artist's rendering of the Great Chicago Fire. The digital bootstrappers at tech startup hub 1871 say they're inspired by the risk-taking innovation that followed. To get a glimpse of the future of innovation in Chicago, you have to visit one of the oldest buildings in the city. Up on the 12th floor of the Merchandise Mart an unusually high level of entrepreneurial energy is coming from a 50,000 sq. foot workspace called 1871. In a large communal space 20 & 30-somethings are sprawled on couches, glued to laptops, and of course slurping coffee. These digital dreamers are all here for one reason. They want to be the next Groupon or Grubhub...or if they’re lucky, Google. This is what a tech incubator looks like. “It means a place of risk and a place to collaborate, a place to challenge, a place to compete, a place to win, and a place to put Chicago on the map,” says Frank Muscarello, one of the first entrepreneurs to work at 1871. Muscarello is the founder of MarkITx, an online marketplace for used IT equipment. A year and-a-half ago it was just an idea. Now it’s one of the most promising startups in town. “This whole thing, this whole ecosystem at 1871 is all about newness and creativity, innovation and disruption,” he said. Economists say the biggest risk to the economy today might be companies not taking enough risks. Chicago already has a reputation for being more risk-averse than other parts of the country. But a new bunch of digital entrepreneurs at places like 1871 are starting to change that — with a conscious nod to the past. The name 1871 refers to the year of the Great Fire. That disaster killed hundreds, left one-third of the city homeless and burned 18,000 businesses to the ground. Yet according to Heath Carter, a history professor at Valparaiso University, it was also a turning point. “1871 brings catastrophe but it’s also quickly seen by many in the city here as an opportunity,” Carter said. The city was already known for its boom and bust economy — so why not take a chance on rebuilding? Long before the fire, a wild and woolly capitalism had already taken root in the city. Carter says to understand how that happened you have to start with the river. And so that’s where I met up with him on a recent afternoon. As we walked along the river’s edge near Wolf Point, Carter described what it would have looked like 170 years ago. In fact, the grain industry shows just how disruptive this new economy was. In a few short years, you went from sacks of wheat to giant grain elevators to an entirely new commodities exchange. Suddenly at the Chicago Board of Trade you could bet on the future price of grain and make a killing. Taking a risk in those days was almost irresistible according to Rima Schultz, a Chicago historian who studied the mid-19th century version of startups. “So if you didn’t take a risk, if you didn&apos;t borrow money. Stayed still, so to speak, didn’t reach out to develop a new business...[you didn’t really fit in],” she said. Schulz adds that there was also tremendous workforce mobility. Like today, hungry entrepreneurs jumped from one opportunity to the next. “I looked at maybe 400 businessmen that I traced through their credit reports. And 1/3 of them go bankrupt. I mean bankruptcy was relatively ordinary,” she said. Entrepreneurs would often lose everything. But then they’d dust themselves off and build something new. So it’s no wonder that the city did much the same after the Great Fire. “There were lots of ideas, some things worked, some didn’t but Chicago was a laboratory for all sorts of experiments,” Carter says. Steel kyscrapers rose upward, refrigerated trains shipped meat cross country, and by the 1893 World’s Fair, Chicago was again seen as a center for innovation. Which brings us back to the digital bootstrappers of today like Frank Muscarello. Not long ago Muscarello suffered a major setback when a previous business of his went under. Muscarello says bankruptcy was a bruising experience, but nothing to be ashamed of at 1871. “There’s not this negative connotation around failure. Because it happens, you know? Unfortunately 99 percent of these companies that are here are going to lose and that’s a risk you understand going into it,” he said. It’s hard to pin down exactly how many of these companies have failed or will fail. But in the last 5 years roughly 1300 tech start-ups have launched in Chicago. Of those, just 6.6% have been acquired or gone public according to Adam Calica, product manager at Built in Chicago. In other words, a lot of risk-taking has yet to pay off. And that’s perfectly fine with Linda Darragh, head of the Entrepreneurship program at Northwestern’s Kellogg business school. “It drives me crazy when I still hear people in Chicago say that Chicago’s risk-averse. People don’t understand that that’s changed,” she said. But Ira Weiss an angel investor who teaches at the University of Chicago’s Booth School of Business, thinks Chicago still has a ways to go. He points to the culture of rapid turnover at young tech startups. "In Silicon Valley it’s very common to work at a company and then they hop around. So people will have a new job every couple of years, that’s normal," Weiss said. "But here [in Chicago] you&apos;d ask the question: &apos;Well, can that person hold down a job&apos;?" Darragh thinks as long as Chicago continues to encourage risk-taking that mindset will change. And she says the energy in the tech startup scene is no longer exclusively on the the coasts. Or maybe it’s just come back.